The Warriors (Paramount Pictures,1979) UK Quad 30" x 40"
These are the Armies of the night. Can you dig it? Can you digggg it. The Furies, the Boppers, the High Hats, the Lizzies, the Turnbull AC's, the Gramercy Riffs... and these are The Warriors. They're from Coney Island. Now they're in the Bronx, 27 miles behind enemy lines. Between them and safety, stand 20000 cops and 100,000 sworn enemies. They've got one way out, they've got one chance, they've got one night. 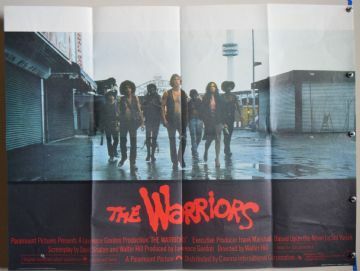 A truly magnificent gang film starring Michael Beck, James Remar, Dorsey Wright, Brian Tyler and David Harris. The poster has the tiniest white paint in the credits.